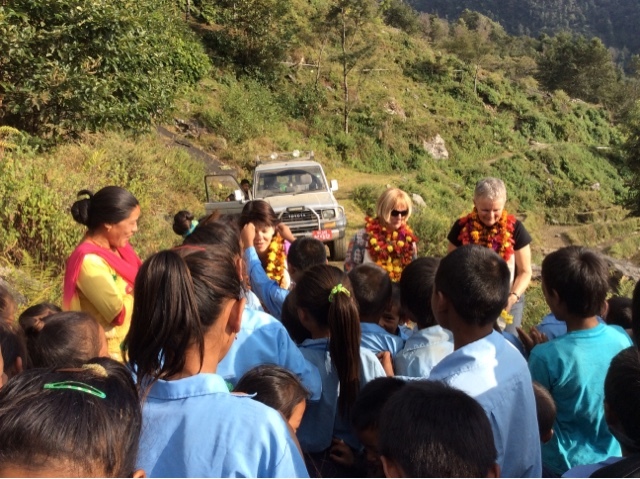 We departed Kathmandu at 730 in our jeep loaded with donations of blankets and school equipment. I was surprised to see how much traffic was on the highway considering the fuel situation. We made good time to Dhading 2-1/2 hours were we transferred all the bags and camping equipment to a local truck, which us a lighter load allowing the jeep to negotiate the extremely rough conditions that will follow for the next 5 hours. After lunch we began our bone jarring drive to the village of Majuwa, both Christine and Jen had no idea how bad the road was until we hit pot holes that would swallow a car. We stopped at Danshing to inspect the damage to the school, no school big damage. 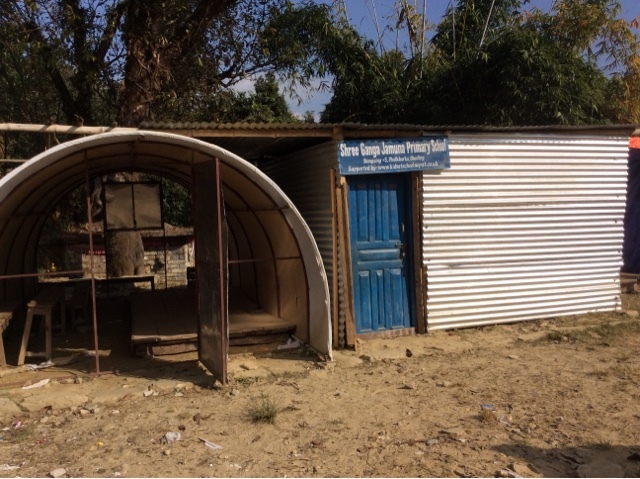 The local villages with the financial assistance of a Kathmandu doctor a temporary has been erected. 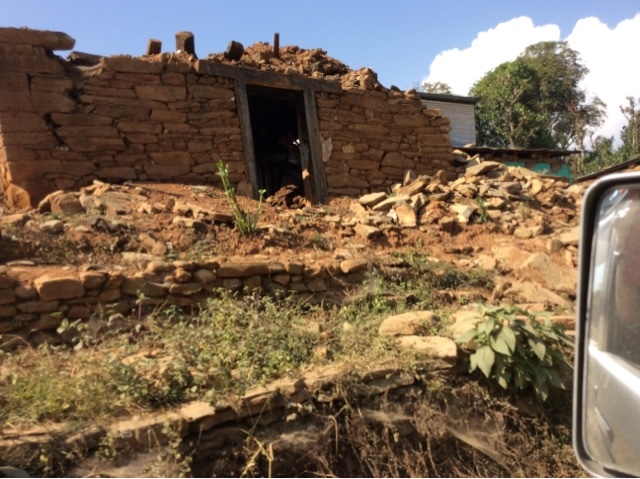 We also sadly noticed on our journey many homes destroyed by the earthquake, but people have been pro active in erecting temporary homes from tin and other local materials. Ten minutes before reaching our destination we were hijacked by the children of Saraswasi school. Christine and Jen were overwhelmed with the joyous greeting and excited smiles of the children as well as the adults. 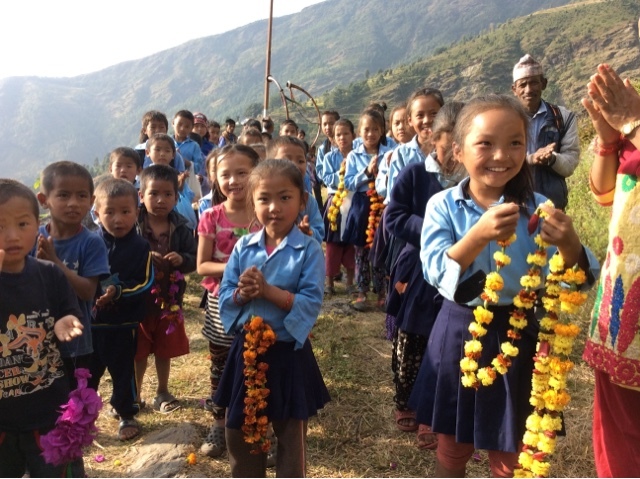 Each child has tirelessly threaded marigolds and hibiscus to make mallas to place around our neck as an official greeting. Last count we were weighted down with 20 Malas each. The adults played local horn instruments and ceremoniously escorted us to the village.